Artificial intelligence is with us to stay, and you can expect solutions to great challenges, but governments should be prepared to invest in education and research to keep up with the two global leaders of the field: the United States and China. This is in essence what several speakers said recently at an event held at the World Intellectual Property Organization. WIPO recently published a report [pdf] on artificial intelligence patenting and scientific publications, showing a sharp increase in both, and China and the United States leading the game. This report is the first in a WIPO series on technology trends (IPW, WIPO, 31 January 2019). 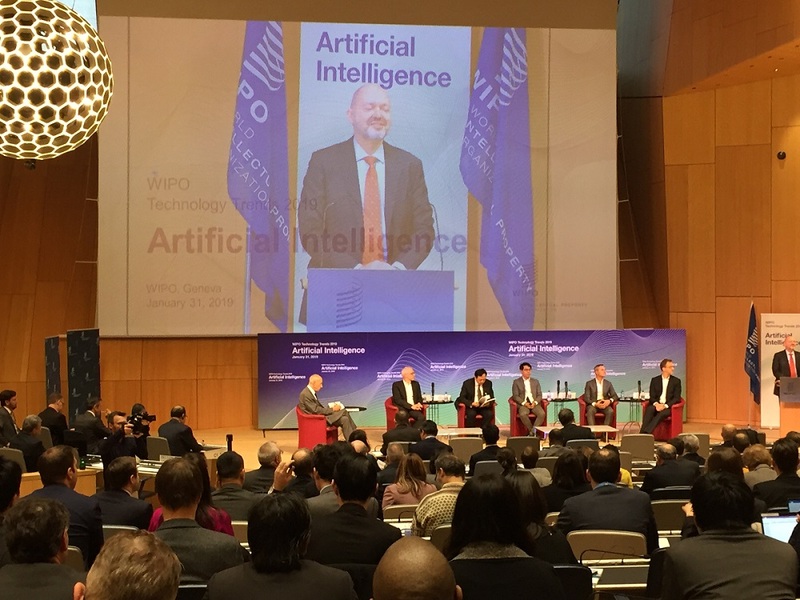 Invited to comment on the report and offer their views on artificial intelligence (AI), a panel of experts was gathered on 31 January at WIPO for the launch of the report. WIPO Director General Francis Gurry indicated that he hopes to embark on a discussion about AI with WIPO members in the middle of 2019, not providing any more clues as to what form this discussion would take, but said the discussion would be confined to WIPO’s mandate and field. The agenda of the panel and launch is here [pdf]. “AI is the new electricity” said Andrew Ng, CEO, Landing AI and deeplearning.ai, California, US, speaking via video call. He predicted that every industry and every economy will be impacted by this disruptive technology. Optimistic about the ability of AI to solve major challenges of today, such as climate change, education, and health care, Ng also warned about the technology impacting many traditional jobs. Governments must “heavily invest” in education, he said, so everyone can benefit from the rise of AI, and so that people can get possibilities of lifelong learning. Ng underlined the importance of AI regulation, but said it should be thoughtful about protecting citizens while also creating room for the positive innovation. Developing countries should not try to reinvent the wheel, according to Ng, and rather exploit their own strengths. For example, he said, countries with a mining industry could seek to develop AI solutions for mining, and coffee-producing countries could automatize the exploitation of coffee, how farms process and export coffee beans. Most of the value that will be brought by AI is not yet created, and will be built in the future, he said, and there will be opportunities for everyone, including small countries and developing economies. The “AI pie” is quite big today, but only a small fraction of what it will be in the future, he said. In moment of technological disruption, leadership matters, Ng said. If governments, universities and industry work together to encourage education and innovation, then all nations and all people have the opportunity to be part of this new AI economy. Mu said the report provides important information for governments, providing growth rate, and share of volume in AI patents. It shows that it might make sense to change cooperation policies, and adjust science and innovation policies in region and countries, he said. The future depends on technology, he said, but also choices, in particular on selecting technologies that will have a positive impact on society. Prof. Dario Floreano, director of the Laboratory of Intelligent Systems, Ecole Polytechnique Fédérale de Lausanne (EPFL) and the Swiss National Center of Robotics in Lausanne, said he was surprised to see that the number of patents on robotics is much lower than patents on AI. One reason, he said, is that the WIPO report focuses on AI but robotics also includes areas such as mechatronics, sensors, activators, and mechanical designs, and those keywords are not always necessarily included in patent search. The fact that there are more scientific publications than patent applications in robotics shows that it is a field in rapid growth. Robotics can be applied in many fields, such as urbanisation, with machines doing inspections, ensuring safety; the ageing society; and transportation of humans and goods, with the advent of delivery drones, he said. After software-based AI, which taps into very large databases, new algorithms will be needed for robots, able to learn and capitalise on little data, much like human and animals, which do not need millions of units of data and alterations. Erich Rütsche, technology & IP leader Europe for IBM Research in Zürich, Switzerland, predicted that AI, as a highly pervasive technology, might become like internet. Now “it is a big topic”, but in a few years, it will be embedded everywhere, he said. “If you associate Siemens with washing machines, I ask you to reconsider,” said Norbert Lütke-Entrup, head, technology & innovation management for Siemens Corporate Technology, in Munich, drawing smiles in the audience. Siemens is a large industrial player in the field of automation, which is at the heart of fundamental challenges of mankind, including urbanisation, and climate change, he said. Technology can help doctors with diagnostics and medical images interpreting, he said. For other industries, AI can apply to complex devices with complex control policy, such as wind turbine parks. Wind turbines interact with each other, he explained, and even the best engineers cannot really comprehend what is happening with those complex interactions between wind, weather, and the different turbines in the park. Algorithms can optimise the efficiency by 3 percent, which represents “tremendous economic gains,” he said. Prof. Yindalon Aphinyanaphongs, New York University School of Medicine, US, said however that it is improbable that robots will replace surgeons in the future. There are value criteria and living, social, and family factors that influence decisions, which AI won’t solve. In the audience, a patent analyst at Swiss company Nestlé talked about what he called “the elephant in the room:” the insufficiency of disclosure of AI models. It is very important, he said, to sufficiently specify ways to describe models clearly. He made a comparison with biological sequences. Unless we set up some specifications and rules to sufficiently disclose and describe models, it will result in a lot of invalidation cases and grey areas, and legal uncertainty for companies, he said. WIPO director Gurry replied that the sufficiency of disclosure in patent applications has been discussed by WIPO member states for a long time, in particular in the biological area, and it is interesting to see that topic now coming to AI. For Lütke-Entrup making the entire models public would not help very much and would hinder innovation. “Companies need to have some trade secrets after all,” he said, however arguing that algorithms need to become explainable. With the US and China leading the game in AI patenting and scientific publications, a member of the audience asked about the prospects for Europe in the next couple of years. Rütsche said he was surprised, even “shocked” by the lack of European companies in the leading companies in the report, except for Siemens. For AI, access and control of data is an important aspect of the innovation ecosystem, he said, as well as governmental support, pointing at China’s heavy investment in AI. He advocated for some “homogenisation” of Europe, hindered by “so many borders” and national regulations. Floreano also called for more investment in Europe in robotics and AI, and underlined the “Made in China 2025” programme. "WIPO Event: AI On All Fronts – Health, Cities, Agriculture – But Investment Needed; Europe Lagging" by Intellectual Property Watch is licensed under a Creative Commons Attribution-NonCommercial-ShareAlike 4.0 International License.